Almost forgot I saw two East Coast trains on the Durham Coast Line through Sunderland this afternoon, one in each direction. Don't think I've ever seen it happen myself before but I guess it might happen more times than I've realised! "Engineering work between Darlington and Newcastle from 13:30 on Saturday 2 until 12:30 on Sunday 3 March 2013"
"An hourly diverted train service will run between York and Newcastle, not calling at Darlington and Durham"
There's also some travel information for trains by other operators. Yeah, that's been going on for a while. I've seen it happen a few times over the last few two weeks or so. 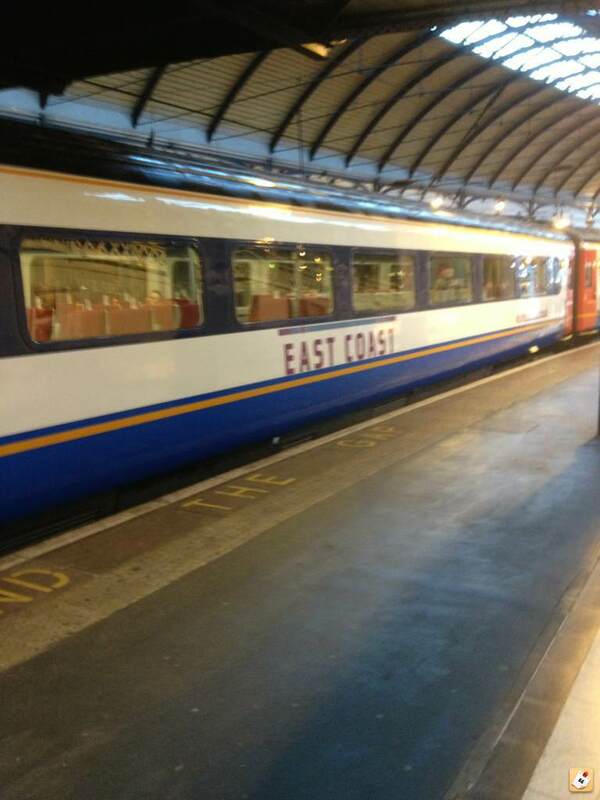 I got such a shock when I was in Sunderland station and a massive East Coast train came blundering through. Everyone got such a shock in fact - many children went running from one side of the station to the other to see what it was causing such a racket. I was on one a month or so ago, that diverted via Leeds and Wakefield because of work just south of York. There are photos on flickr of British Rail trains on the Leamside Lime at Penshaw and the Victoria Viaduct taken in the 80s and early 90s on Sunday diversions. The bidding for the new Intercity East Cost franchise has now begun, with a start date of February 2015 for theline to pass back into private hands. It'll be interesting to see who are in the running for this one. I've been a regular East Coast user for the past 3 years, and I've very rarely got a complaint about it. (01/04/2013, 22:01)aureolin Wrote: [ -> ] It'll be interesting to see who are in the running for this one. I've been a regular East Coast user for the past 3 years, and I've very rarely got a complaint about it. I've read that Virgin Trains are very interested in bidding for it. I've no idea who else though. I'm not a supporter of privatisation, but at least I've heard very good things about the way Virgin run the WCML franchise. It'd be interesting to see if the First Group go in the running for it - I'd certainly assume they would, given what happened on the WCML. I use East Coast pretty regular and despite having issues with their call centre/customer service team, I do think they are an excellent example of how nationalisation can work. They are flying high in satisfaction surveys and have made the government millions. I cant understand the need to sell them off, espec when the ECML is going to fall further down the pecking order behind the WCML and HS2 when that is built. As for privatisation, if CrossCountry and Northern are anything to go by, lets nationalise the lot! (02/04/2013, 22:18)Andreos1 Wrote: [ -> ] As for privatisation, if CrossCountry and Northern are anything to go by, lets nationalise the lot! CrossCountry are generally all right punctuality wise for me, but I refuse to get on one of their trains if it's not a HST working. The Voyagers smell worse than public toilets. (02/04/2013, 22:18)Andreos1 Wrote: [ -> ] I use East Coast pretty regular and despite having issues with their call centre/customer service team, I do think they are an excellent example of how nationalisation can work. Because it was only ever meant to be short-term until the DfT could sort out a new agreement. As for Northern Rail, a franchise the SFA got wrong by letting it with no growth and look at it now. I have been lucky to get a HST Cross Country a few times, but for the trips I do, its always a Voyager home. Your right, they stink. I had to go via Carlisle on a Northern and change onto a Virgin to go north when there were problems on the ECML a month or so back. I was hoping it wouldnt be a Voyager - it was and I was amazed at the difference between the two companies. However... Not sure on a Virgin diagram, but some of the CrossCountry's start 6ish in the morning in deepest darkest Plymouth and if I jump on it 11 hours later in Glasgow to head south, its got however many gallons of pi** and shi* swimming about in it. The tanks must never get emptied. However whenever you pull up at Kings Cross, I always notice the toilets being emptied before anything else. I dont envy you that journey from York mind - at all! Your right in both instances and two additional reasons why East Coast should be made an example of and why suits in offices down South cant set the terms of a contract re Northern. Mind, having used some of the ancient stock on South West Trains, its amazing what a refurb can do. Imagine a pacer after a decent refurb? Has anyone heard of an East Coast train heading South into Kings Cross, end up going in backwards or even how they would do it with the track set up down there? Heard a story of forward facing passengers for the entire journey, ending up going 'backwards' into the station this week due to signalling problems. 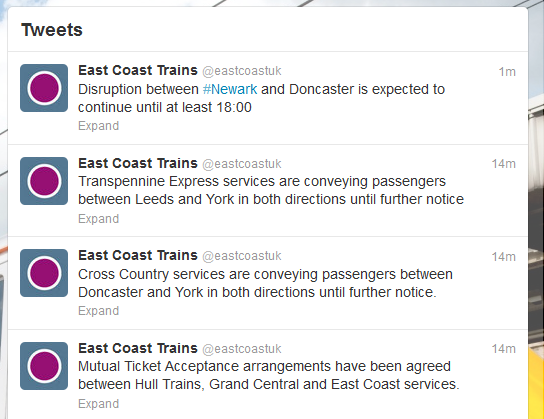 Broken down freight train outside of Newark is causing havoc on the ECML. 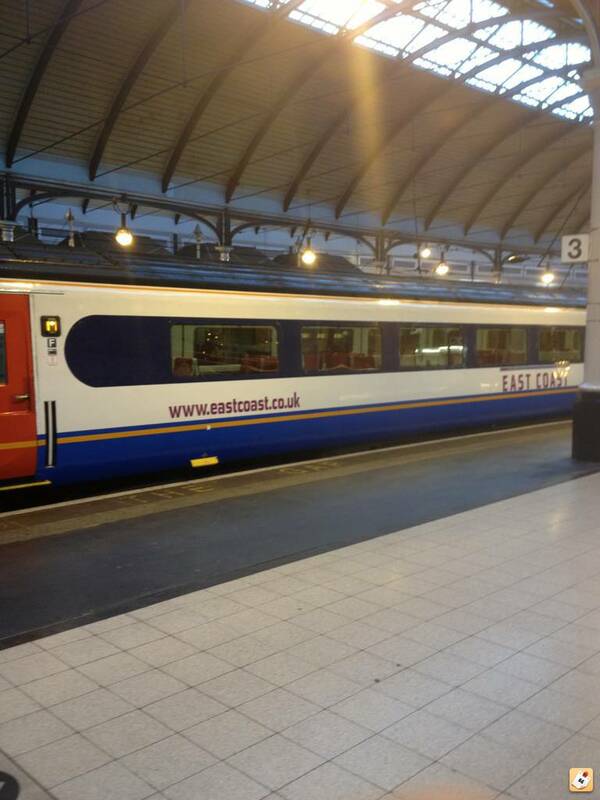 (02/03/2013, 20:28)Brandon Wrote: [ -> ] Almost forgot I saw two East Coast trains on the Durham Coast Line through Sunderland this afternoon, one in each direction. Don't think I've ever seen it happen myself before but I guess it might happen more times than I've realised! I remember back in the 90's GNER would often divert onto the Durham Coast, I have been in both directions on a diverted NCL-LKX Service, it was amusing because it once came to a standstill in Sunderland coming down from London, there was a bloke demanding the guard open a door to let him off the train in Sunderland, why, becaise he lived in Hendon, he was not amused at being taking against his will to Newcastle, even though his ticket to there. These days I don't know if it is still a common diversion as the 91's are out of gauge going through S'land i think. HSTs still run up the Durham Coast Line, but all 225s (91s and Mark 4 sets) normally run Kings Cross-Darlington and Newcastle-Edinburgh. Stood at Newcastle station at half 6 this morning, and I noticed one of the HSTs was running with what looked like a new set of coaches. I'd originally thought this was just a repaint to a new livery, but the interior is completely different too. (Bad) iPhone pics below. (04/09/2013, 07:59)aureolin Wrote: [ -> ] Stood at Newcastle station at half 6 this morning, and I noticed one of the HSTs was running with what looked like a new set of coaches. I'd originally thought this was just a repaint to a new livery, but the interior is completely different too. (Bad) iPhone pics below. East Mids Trains carriages by the looks of it. They had an entire set a few years back. Wonder why it is just the carriages this time? Yeah, they do. They also run some Class 180 Adelante trains.